When searching for elusive New England ancestors, locating where they may have moved within New England or beyond is critical. For example, a genealogist might have traced his Michigan family back to, say, a great-great-great-grandfather in Batavia, New York, in 1820, but where was this family earlier? Lois Kimball Mathews’ Expansion of New England, first published in 1909, helps such searches in two ways. First treated are the larger migration patterns. Mathews notes that one large stream of early New England families, from the central and eastern Connecticut towns of Hartford, Windsor, and Lebanon, were settled by the 1720s in the western Connecticut towns of Litchfield and Torrington, only soon to stream northward into the hill towns of the Berkshire Mountains, and after 1760 into the first communities of central and northern Vermont. After the American Revolution, descendants of these same families appear in central and western New York, in such places as Batavia. By understanding this particular migration through New England into western New York, our genealogist with the forebear in Batavia can begin to track his family eastward. Similar streams of migration are identified and described by Mathews. Besides identifying larger migration patterns within New England and beyond, The Expansion of New England also helps the genealogist by examining in detail virtually all printed town histories and other works extant in 1909 that note specific migrations. In this sense, her work reminds one of Clarence Almon Torrey’s New England Marriages Prior to 1700. Like Mathews, Torrey combed the printed literature of his time, noting the places and dates of all seventeenth-century marriages plus all known couples for whom no marriage is recorded. Using Torrey, genealogists can themselves check these genealogies, town histories, articles, and multi-family works, and often discover the homes of their New England ancestors. Similarly, researchers using Mathews’s work are guided to specific town histories, and other printed sources, noting individual migrations from town to town within New England and beyond. In addition to identifying migration patterns, Mathews also explains how and why settlement in and from New England expanded as it did. 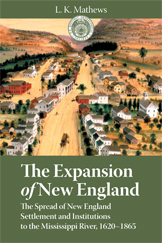 She calls attention to the role of religion and ideology in first-generation immigration to New England; the influence of land companies and speculation in northern New England; the impact of colonial wars on both the retardation and encouragement of new settlement; and the effect of selectmen, colonial legislatures, and eventually the federal government in shaping the creation of new towns and local institutions. And, as New Englanders moved west, Mathews discusses their tendency to replicate New England institutions and cultural practices in each new setting, often using the same town names for new settlements. Although today a large literature is devoted to New England settlement and migration, most of the concepts in later works were first noted by Mathews in The Expansion of New England. This work is perhaps the foundational study of this subject, and deserves close examination. Much about the settlement patterns of early New Englanders can be learned from this book. Adapted from the foreword to the new NEHGS edition of Lois Kimball Mathews’ Expansion of New England. My ancestry was a part of this migration. You mentioned Batavia (NY) in your posting. Does this volume have information like that on other families that migrated into the Phelps Gorham purchase lands. My particular interest is in the Ontario & Yates Counties. The communities of interest are Naples, Middlesex, Italy and Rushville. The Clark’s, Metcalf’s Watkins, and Slayton’s were the forefront of the migration in that area. Does the publication refer to that area?